Thousands of people stand in solidarity and in unanimity at Galle Face Green on 19th of March 2019, in protest of proposed Metro Colombo Solid Waste Management Project which is being under construction in Serakkuliya (Aruwakkalu) in the Puttalam District by the Ministry of Megapolis and Western Development. 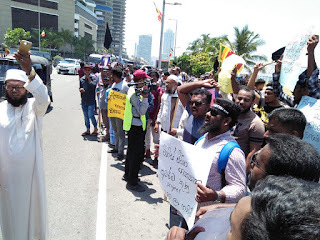 The protest was organized by the activism group “Clean Puttalam” team including social activists, environmentalists and local community members together with other civil movements to demonstrate against the proposed landfills site at Serakkuliya in Puttalam. The activists believe that the Environmental Impact Assessment (EIA) Report which was prepared and approved the proposed project has many shortcomings such as failure in analyzing the significant ecosystem in this location and deliberate ignorance of the impact assessment of the lagoon, aquifer resources. Moreover the report did not take any mitigation measures on the health risks of the people living in this area. Further the report also failed to consider the leachate mixed rain water leaking in to lagoon without proper pre treatment thus causing major lagoon pollution. The other factors include abundant damages due to bombing vibration and undesirable upward ground water pressure during rainy season. Minister Ranawaka has stated that the disposal of electronic waste in to the garbage disposal will not be abandoned just because there are several issues. From such statement the protesters understand that that Minister intentionally and deliberately wants to cause health risk to human life and threat to the ecosystem and economy of poor people in this area. Above all the project could also result in human-animal conflict similar to what was witnessed in Ampara recently. The activists expressed their anger on “Why the Government is keen on this dumping of garbage a location which is 140 KM away from Colombo?”, “ Why the Government has proposed the out dated land filling method endangering both human and environment, when there are multiple latest technology for waste management?”. Rather the activists suggest that the bio degradable wastes could be made into compost and be issued free of charge to cultivators to replace fertilizer subsidy and on the other hand plastics, glass, metal and papers could be recycled while the rest of the wastes could be incinerated to generate energy. The Clean Puttalam team conveyed their deep concern on the natural resources of that area that is soon to be a scarcity of natural recourses and they urge each and every citizen of Sri Lanka who love their mother land to join hand with them to voice against the dumping against garbage for a bright future of people of Puttalam.